Click on any of the dental service links below for detailed dental information, including procedure time frames, pictures, and procedure considerations. Avondale Dentist, Charles Clausen combines gentle, personalized care, professional service and advanced dental technology. Dentistry for Children - focused on preventing and correcting childhood dental problems and monitoring oral-facial development. 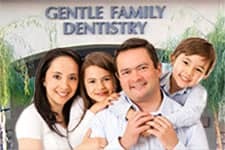 Family Dentistry - preventative dental maintenance, diagnosis and treatment of a wide variety of conditions affecting the teeth and gums. Preventative Dentistry - protection against periodontal disease, tooth decay, and stress-induced conditions such as teeth grinding and TMJ. We offer anti-anxiety dental options to help eliminate stress and anxiety from your dental visit. Laughing Gas Nitrous Oxide - anti-anxiety temporary sedation for adults and children. Oral Sedation - conscious sedation dentistry for patients who may be too anxious and would choose to be sedated through a dental procedure. Cosmetic dentistry can improve your self-esteem and social opportunities. A beautiful smile provides confidence and charisma. All-Ceramic Crowns - are the most natural looking crown with high translucence for a beautiful smile. Bonding and Veneering - can repair chipped front teeth, resurface the stained teeth, and correct misaligned teeth. Cosmetic Recontouring - for reshaping and smoothing the edges and corners of teeth for aesthetics and functional corrections. Dentures (custom design) - create the look you want with traditional fitting or implant retained dentures. We can match the shape, color and alignment of your existing teeth. Invisalign™ - wireless orthodontic appliance for re-aligning teeth; great for both adults and teens. Lumineer - Emprethin - ultra thin, no-preparation ceramic veneers are minimal invasive veneers and a good option for sensitive teeth. Porcelain Crowns Fused to Gold - stronger than all-ceramic crowns and look like natural teeth. Porcelain Veneers - strong durable veneers for a beautiful permanent movie star like smile. Smile makeover - create the smile of your dreams: color, shape, size and alignment make your smile. Teeth Whitening - in-office and at-home dental whitening options. Tooth-colored Fillings - for natural looking restorations that are unnoticeable, we provide white fillings, on-lays, and in-lays. Cracked Tooth Restoration - restoring an endodontically damaged tooth root and/or the function of a cracked tooth. Endodontics - options for saving a diseased or injured teeth. Endodontic Re-treatment - for a root canal treated tooth where the pain has returned. Endodontic Root Canal Therapy - saving damaged teeth and preparing the remaining tooth for an artificial crown. Traumatic Root Injuries - emergency dental care to save an injured tooth. Orthodontic Dentistry - focused on the treatment of improper dental alignment. Pediatric Orthodontics - age appropriate and preemptive treatment of children's oral-facial development problems. Braces Types - choices in dental braces for correcting misaligned teeth that meet your lifestyle. Invisalign™ - Invisalign: wireless orthodontic appliance for re-aligning teeth; great for both adults and teen. Retainer Replacement - emergency dental appliance replacement and repair. We offer several treatments to help prevent and correct periodontal disease. Periodontal Dentistry - for restoring and maintaining the health of gum tissue. Periodontal Treatments for Gum Disease - periodontal exam, dental scaling, root planing and gum grafting. Tissue Reduction and Crown Lengthening - functional and cosmetic restoration of excessive gum tissues. Dental Bridge - Removable - a partial denture that replaces one or more missing teeth between the remaining teeth. Dental Crowns - we provide dental crown options to achieve your desired cosmetic and restoration results. Dental Crowns - Gold - restorations are the strongest and most natural feeling crown replacement, and a good choice for back teeth. Dental Crowns - Porcelain Fused to Gold - natural looking crowns with a gold bonding surface for added strength. Dental Implant - a permanent artificial tooth anchor that replaces the root of the lost tooth. Implant-retained fixed-dentures – permanent full arch restorations that feel like natural teeth. Implant-retained removable-dentures – full arch restorations that offer additional stability over conventional dentures and are completely removable, and easy to clean. All on 4® - same day dental implants - full arch dental implant treatment with dentures in the same day. Dentures (choices & procedure) - Full and partial dentures to meet your needs. Full-Mouth Reconstruction - the rehabilitation of the jawbone, teeth and/or soft tissues required to restore normal dental function. Inlays Onlays - for the restoration of teeth that require more than a filling but not the replacement of the crown. Jaw Surgery - correct a wide range of minor and major skeletal and dental irregularities. Oral Surgery - for difficult extractions and correcting extraction complications. TMJ (Temporomandibular joint) disorder - Therapy for pain in or around the ear, tenderness of the jaw, popping noises when opening the mouth. Obstruction of the airway, resulting in heavy snoring, poor sleep, and disruption of breathing is correctable with a dental appliance. Sleep Apnea - diagnosing and non-surgical treatment for snoring and airway blockages that occur during sleep.